School libraries are crucial. As someone who provides training about them, I would say that wouldn’t I? But I am far from alone. The National curriculum in England: framework for key stages 1 to 4 explicitly states that schools should provide library facilities. Education guru Stephen Heppell tells us ‘The school library is incredibly important – much more so than in the past. It’s a place where everyone comes to share and learn.’ CILIP president Barbara Band gave a wonderful speech extolling school libraries and librarians at the Greenaway and Carnegie awards ceremony earlier this week. Michael Morpurgo calls libraries the ‘heart and soul’ of any school. 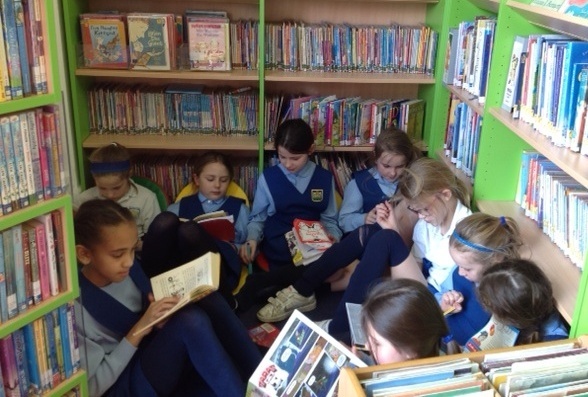 They support teaching and learning, they develop literacy skills and, as the lovely photo from Notre Dame School in Cobham vividly demonstrates, they foster reading enjoyment – vital at a time when fewer and fewer children and young people read for pleasure. It’s good to see that support for statutory school libraries is growing. Claire Fox of the Institute of Ideas has written a provocative piece for TES about school libraries. Well worth a read, though likely to inspire ire in some readers. For a different perspective, look at a school librarian’s response and at what author and passionate library advocate Alan Gibbons has to say. Of course, to be effective, a school library needs a librarian. Here school librarian Jennifer Horan sets out five reasons why they are important. Children’s author Emma Barnes makes a heartfelt case for schools library services – a case I totally endorse. The value of school libraries also comes through loud and clear. Reading Educator Adam Lancaster’s blog is consistently interesting about reading and libraries. This article explores what he terms ‘touch-paper library conundrums’. Not everyone will agree with all he says. Finally, let me quote Michael Rosen: ‘School libraries should be a focal point for a school. In a school library there should be resources to support every aspect of school life: every project, books to support sport, dancing, art, music; and it should also be the place to go for stories and poems. It should be an unmissable, unavoidable place.’ Yes!